← Healthy Banana Splits: Yes, You Can Have Them For Breakfast! Abracadabra, popcorn in minutes without dirtying pots, breaking out the air popper or resorting to shelf-stable, over-preserved microwave packs. Magic? Well, almost. Easy? Yes! And there is even more good news with this recipe. In addition to being ultra-healthy, it requires no extra oil, butters, salt, or toppings unless you desire. And even then, you can put on what you want and leave out anything that makes you or the diet police feel guilty. See, nothing up my sleeve. Yet. 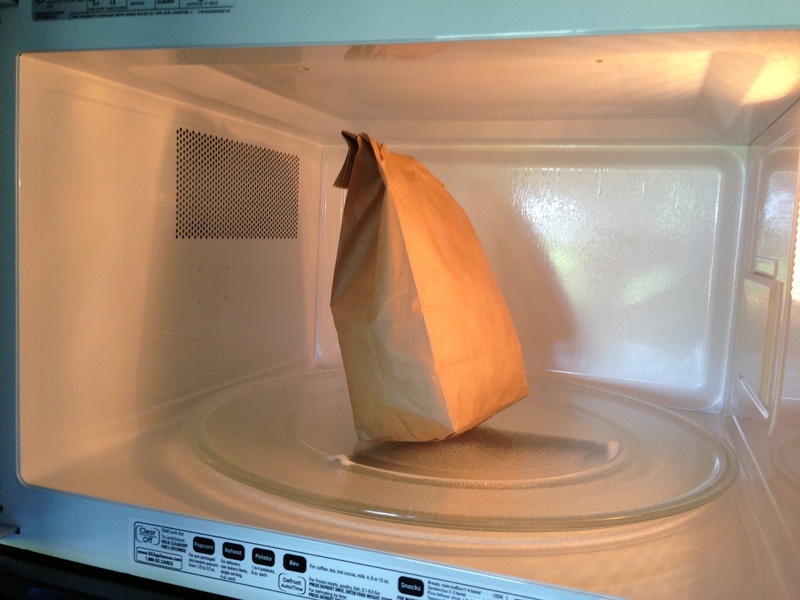 Watch closely while I put the un-popped kernels of popcorn into the brown paper bag, fold the top of the bag over two or three times to tightly secure, and put the bag into the magic box (that would be the microwave). With appropriate flourish, press the popcorn setting — or cook on high for 2 to 3 minutes — listening carefully for the popping to slow down to several seconds between pops. The only trick, if you could call it that, is something all magicians already know — don’t get distracted! During the short amount of time you need to perform this conjuring act you could scorch your popcorn or even risk a paper bag conflagration (that’s just a fancy name for fire, folks) if you walk away and trust your microwave’s automatic popcorn setting from beginning to end. If you smell anything that has you even slightly concerned that some of those precious kernels are burning rather than just popping, press the “end” button quickly! There really is nothing worse than the taste of burned popcorn…unless it’s the oder of burned popcorn. That’s pretty nasty stuff. Or, you can try one of my personal favorite flavor combos, soy sauce and lemon, or soy sauce and wasabi! Mix about 1 tablespoon of soy sauce with a squeeze of lemon or a small amount of wasabi paste and use chopsticks to dip the popcorn piece by piece. It’s super tasty and you can pace yourself. Which might mean your kiddos gobble up their share plus some while you’re dipping away…but hey, you can always make more in a…jiffy (sorry, I just had to work that in somehow). If the number of un-popped kernels bothers you try mixing your popcorn with about a teaspoon of vegetable oil before putting it in the paper bag. This seems to encourage a little more popping, but also makes your paper bag (and therefore the base of your microwave) a little oily. Also, make sure that your popcorn is fresh — it’s the moisture inside the kernel that, when heated, explodes the kernel open. Old popcorn will have lost some of that moisture and there will naturally be more old maid kernels. To give credit where credit is due, The Food Network’s Alton Brown published a good do-it-yourself microwave popcorn recipe a number of years ago (called the Plain Brown Popper), which is what originally clued me in to this nifty trick. Alton uses oil in his microwave popping recipe, plus some tasty seasonings. Salt goes in the bag BEFORE the popping, which I never quite found to work for me. But you might prefer it! Having mastered the magic popcorn trick, I can now include freshly-popped popcorn in the girl’s lunches or turn out a snack for our Friday night movie in just about as much time as it takes Tinkerbell to say “Oh, jingles!” And believe me, that’s pretty darn fast. And the way it disappears…magic. Parent rating: four stars. After all that, I still probably prefer the taste of popcorn popped on the stove top in a couple of tablespoons of oil. But I HATE cleaning the pot afterward…usually because it’s Friday night, we’ve already cleaned up dinner, and there’s nothing I hate more than waking up to dirty dishes. 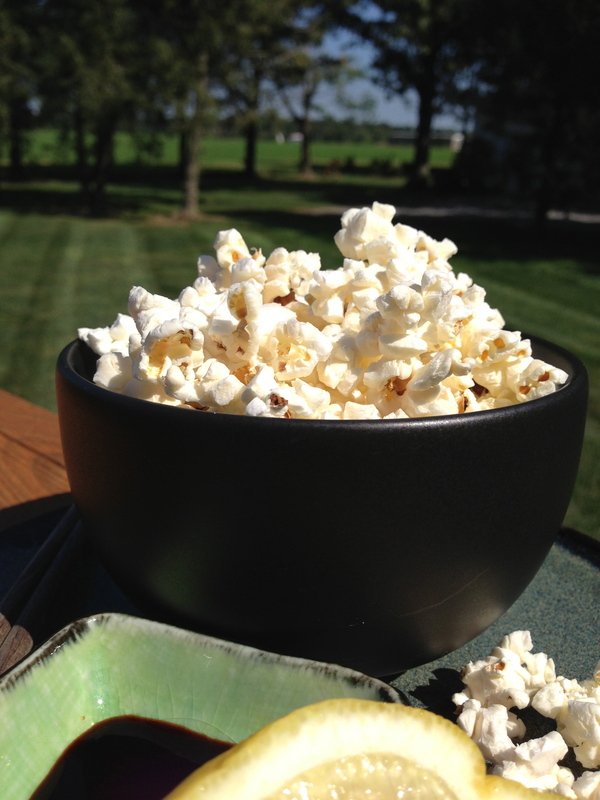 So homemade microwave popcorn gets my vote! Kid rating: Five stars. 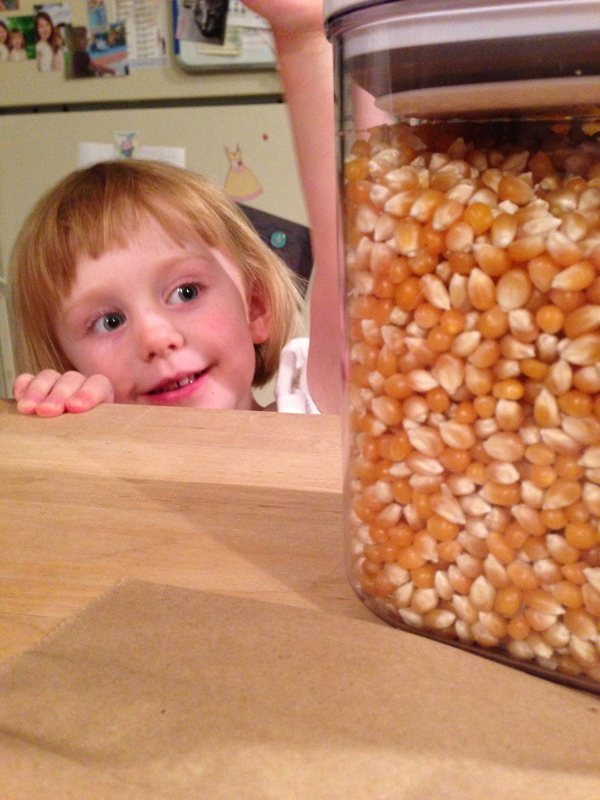 Popcorn is just somehow magical no matter how it’s made, and our girls devour it every time. Winter, summer, spring or fall, this quick recipe is a keeper.